Product prices and availability are accurate as of 2019-04-12 10:14:44 EDT and are subject to change. Any price and availability information displayed on http://www.amazon.com/ at the time of purchase will apply to the purchase of this product. 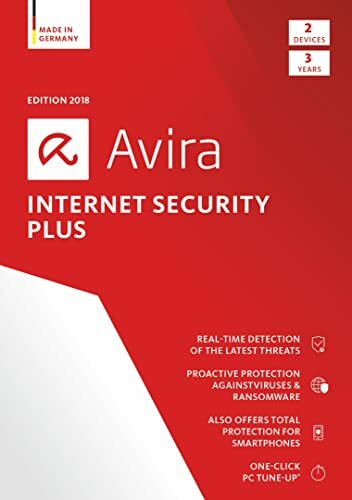 Avira Internet Security Plus 2018 - 2 Device for 3 Years protects your confidential banking information, safeguards you against online attacks, and ensures you always know what your security status is and can control it at any time. 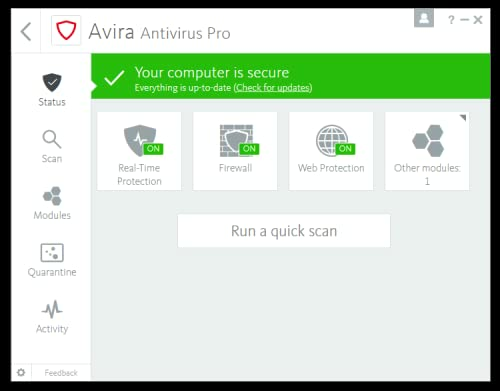 You also get a really handy tool, Avira System Speedup, which optimizes your PC's performance. The best antivirus – and we're not the only ones to say so. Avira Internet Security Plus constantly receives top scores for malware detection, low system impact, user friendliness, as well as repair and self-defense functions. In renowned tests by Virus Bulletin, AVTest, and AV-Comparatives Avira products leave their international competitors trailing, scooping countless test victories and awards. Globally, Avira security solutions protect over 500 million devices securely and reliably against viruses, phishing sites, ransomware & other malicious websites. They are also easy to install and a breeze to use. Driven by the idea of a worry free online life, Avira has offered first-class German-engineered antivirus technology for over 30 years. As a global leader in the use of cutting-edge AI and machine-learning technology, Avira utilizes this expertise to provide integrated protection. This involves comparing millions upon millions of datasets in the cloud to detect threat patterns in real time and protect users from danger. Superior Performance and Security with zero impact on device performance. 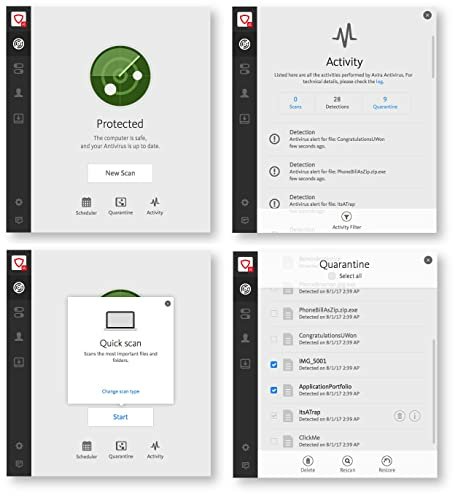 Centralized Management - Display and manage the security status of all devices using the Avira Connect dashboard. Customer Support - The friendly Avira support team is there to answer your questions. Browser Tracking Blocker with Avira Browser Safety - Protects you from companies spying on your online activities. A fully fledged antivirus app with Remote Lock and Remote Wipe, identity protection, tracking, yell, and blacklists. 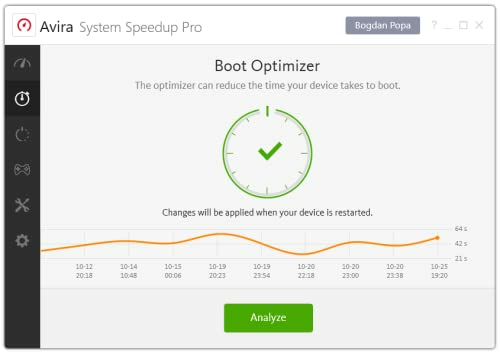 One-click PC performance optimization for faster PC startups and processes. The program cleans up your hard disk, frees up memory, fixes errors, repairs permissions, and wipes clean all traces of your surfing activities. It also includes privacy protection tools such as file encryption and a secure file shredder. 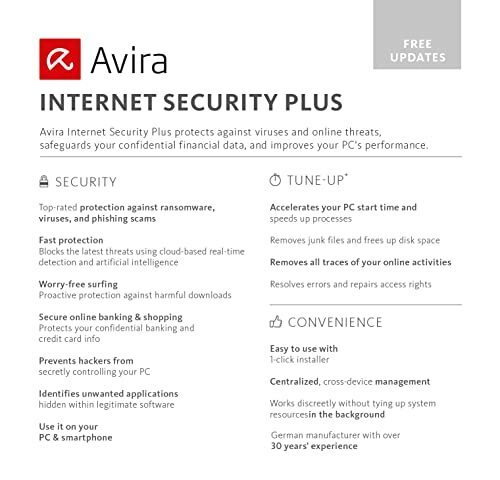 Avira Connect provides you with state-of-the-art protection. Security status checks, smartphonetracking, license management – the free Avira Web Console lets you manage all your devices centrally via the Internet, simplifying your digital life. Antivirus Scanner - Multi award-winning protection against viruses, worms, Trojans, and other threats with Superior Performance and Security with zero impact on device performance. Centralized Management - Display and manage the security status of all devices using the Avira Connect dashboard. Email Protection - Checks incoming and outgoing emails and attachments for malware. Anti-Ransomware - Detects, blocks, and removes ransomware before your data and files get encrypted. Browser Tracking Blocker with Avira Browser Safety - Protects you from companies spying on your online activities.